October 2010 – Sudha Pennathur, LP. Launching the Seventh Annual Sudha Sale this year has been a special labor of love. I am grateful to Harriet and Tom Kostic for donating their prime retail property in down town Mill Valley for the Sudha Sale this year. Amidst all the production we encountered the worst monsoons in 50 years and riots in Kashmir that brought the state to a total stop. Rivers overflowed under flood conditions and artisans had to flee their homes. We could not get goods out of the country for several weeks. Through the diligence of my staff and a lot of hard work by the artisans we were able to complete production for our customers and managed to stock the Sudha Store with precious merchandise. This has provided much needed employment to the displaced artisans. People often ask me what percent of the proceeds goes to the non- profits. I am happy to say that for the last 7 years I have been able to donate a 100% of the sales shared equally between The Redwoods and Bread & Roses in the USA and the artisans in India. I will also personally bear much of the expenses of bringing the products to the US. What I love best about this sale is I can personally help customers pick the right piece of jewelry or scarf and give them fashion advise on what looks good and how things are made. This is the only opportunity for me to interact with the final consumer since I sell directly only to high end retailers. Once again I will be able to offer beautiful master crafted jewelry, scarves, Christmas ornaments and gifts for the holidays at 50 to 75% off retail. Prices range from many items at a dollar to some at several hundred! The Sudha Store brings together my products from the world of the artisan to the supporters of these two wonderful Marin non profits! Seeing this pairing has created a compelling reason for me to carry on this tradition. It allows philanthropy and marketing philosophy to merge for a couple of weekends every year. In addition customers can get a sample of what is offered from my collection at such stores as Bergdorf Goodman, Neiman Marcus, Saks Fifth Avenue and Museum stores and catalogs across the country. This year TV personality of the famed “Bay Area Back Roads” and a good friend, Doug McConnell has graciously agreed to host the auction at the Sudha Sale. As always through their generous support, Peter Merts will capture the sale through his lens and Gary Morgret will transform a bare building to a beautiful and glamorous store! I am grateful to the two executive directors Cassandra Flipper of Bread & Roses and Barbara Solomon of the Redwoods who tirelessly scouted for retail space and organized the volunteers to make the sale come alive. Also Jim Prigoff, Barr Hibbs, Ed Messerly and Craig Potter who put in their time to make this sale a success over the last 7 years, the Board of the two organizations (past and present) and the many volunteers who give their time joyfully to make this a roaring success! What started as a small sale at a home of a friend, the Wolfe’s, to benefit Bread & Roses seven years ago, has taken a life of its own. In addition to the Sudha Store at 23 Throckmortin in Mill Valley for the weekends of November 6-7 and 13-14, we will also launch a web store with a few special items for our east coast and other friends who can’t make it to the store. 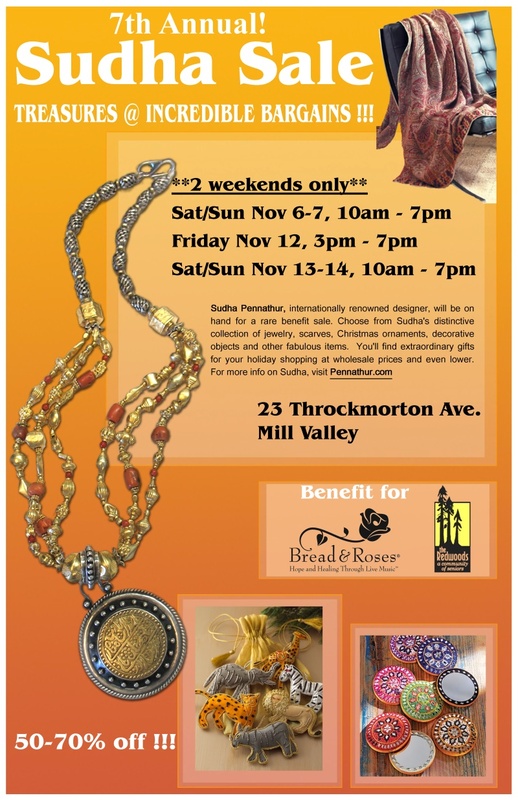 Here’s a link to the Twin Cities Times regarding this year’s Sudha Sale for Bread & Roses and The Redwoods. It’s coming up fast!